Marty Greenfield lives with crushing pain every day due to angina, a condition that is caused by an inadequate supply of blood to the heart. He has suffered a heart attack, and a coronary bypass procedure and angioplasty have provided little relief. His doctor referred him to UCLA to be considered for a heart transplant. 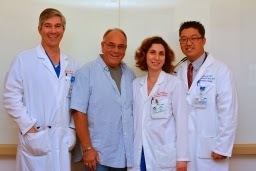 Dr. Jonathan Tobis, a UCLA clinical professor of cardiology, performed an angiogram and angioplasty on Greenfield, 64, but found that he was not a candidate for a heart transplant because his heart muscle function was still good. Instead, Tobis suggested Greenfield to consider participating in a Phase 3 clinical trial that uses a patient's own blood-derived stem cells to try to restore circulation to the heart. The procedure uses the latest technology to map the heart in 3-D and guides the doctor to deliver the stem-cell injections to targeted sites in the heart muscle. "This just isn't about me, if I can help move this research forward so that it helps just one person, it will be worth it." said Greenfield, a married father of two sons who lives near Las Vegas. "We are able to tell by the voltage levels and motion which area of the muscle is scarred or abnormal and not getting enough blood and oxygen. We then target the injections to the areas just adjacent to the scarred and abnormal heart muscle to try to restore some of the blood flow." said Tobis, director of interventional cardiology research at the Geffen School of Medicine and the UCLA Health System.